We are honoured to have had our chapters on Rodborough and Eugene Paul Bennett V.C. 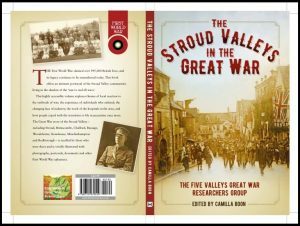 of Rodborough included in this new publication, compiled by the Five Valleys Great War Researchers Group. The book gives a good overview of the Stroud area in 1914-1919 and our Rodborough contribution delves into the fortitude, tragedy and sometimes humour displayed by individuals and our community as they coped with a changing world. A very readable local gem of social history.